This is a gorgeous piece of jewelry, and although I can't remember -where- I first ran across it, I know that the moment I saw it, I fell in love. Like all things that I have to force myself to resist the temptation to buy, that means it ends up here. Because if I can't have it and love it and cherish it... then someone should! This sterling silver wire wrapped bracelet is called "Water Colors" and was made by wrapping 20 gauge wire around a 14 gauge core with an absolutely gorgeous and vibrant lampwork bead as the focal for the piece. I'm in love with it. Not like. L O V E... Love. 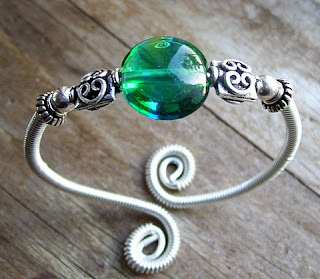 Kittyd on Etsy has a number of this style of bracelet actually. This one, in particular, caught my attention due to it's beautiful colors, but it's by no means the only beautiful piece she has in her shop. Far from it, actually. Handcrafted Jewelry and Supplies by KittyD is filled with beautiful pieces and she has some of the most original and beautiful wire-wrapped pieces I've ever seen. TO VISIT KITTYD'S SHOP ON ETSY, YOU CAN CLICK THE PICTURES ABOVE OR, IF YOU'D RATHER, CLICK RIGHT HERE! I love KittyD's jewelry. The bracelets like this are amazing with a different look on the top than the bottom! Just hearted her shop! I love the bracelet just like this one with the blue focal bead. So pretty! Wow! Thank you so much! :) I'm very flattered! Ohhh, that is beautiful, I can see why you want it! omg thats beautiful! i cant wait until ive had my baby so i can start getting nice things like this! bit too bloated at the mo! lol!